I have been saving my Amazon credit for a long time. I earn Amazon gift cards through the Swagbucks search. I also put all of the loose change from our grocery shopping into a jar and, once I have enough, change it into Amazon credit through CoinStar. And, I’ve recently been earning a few (very few) dollars through Amazon Mechanical Turk. All of that finally added up to enough Amazon credit to place a small order. I ordered a couple useful things. Cleaner for my husband’s coffee grinder. A 3-ring binder to store my letters from my sponsorship kiddos. I also ordered something fun! Our daughter’s first movie! My husband and I already own Tangled and How to Train Your Dragon but we need to slowly expand our collection. We’re rather picky about our animations and will be picking and choosing which ones we show our kids. We avoid those that portray characters communicating with spirits or those that involve dark magic but enjoy some of the classic animations and a select few of the modern ones. 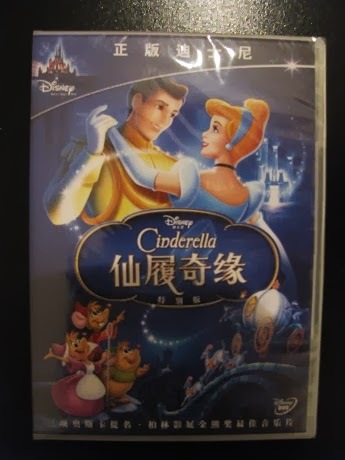 We hope to eventually acquire Beauty and the Beast, Lady and the Tramp, and Robin Hood, plus a couple others I’m forgetting. I’m looking forward to sharing some of our favorites with our daughter! Hubby and I were not expecting a long weekend as he was originally scheduled to work on Labor Day. However, at the last minute, the boss realized it was a holiday weekend and everything was rescheduled. So, we decided to take advantage of Labor Day sales and replace a good portion of hubby’s work attire. As a unexpected benefit to all of our shopping, I found a new swimming suit! I have lost 45 pounds since the beginning of 2009. My old swimming suit was purchased at my highest weight and I realized this weekend how much I’ve shrunk out of it. I spotted this cute swimming suit as we walked into Macy’s. 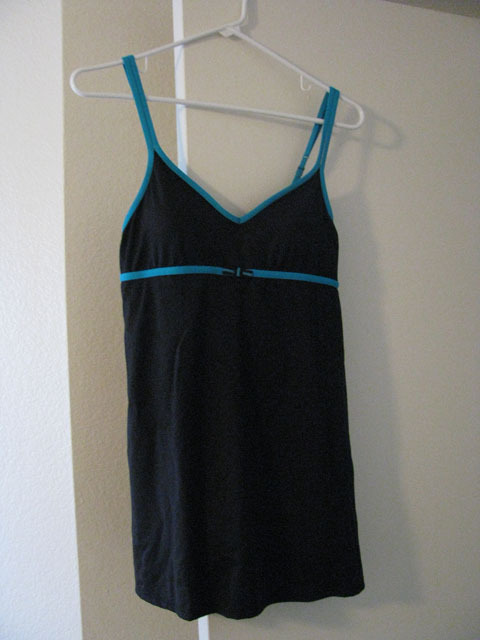 My old swimming suit made me feel immodest even though it was a standard 1-piece. This swimming suit is like wearing a little dress and makes me feel much more covered. I was rather shocked by the sticker price. That tiny amount of Lycra retailed for $98! It had been marked down to $73.50, then $49. Yesterday’s final sticker price was $29.99. Much better! Is anyone interested in trying out a free price book application for the iPhone or iPod Touch? Because of yesterday’s post, I was contacted about offering feedback on a new app. “The 2.0.0 version of Price Book comes with a free companion website. Data can be entered in the website and downloaded to your device and data can also be exported from your device to the website. In this way data will always be safe and secure on the website. I think this app sounds wonderful and is something I would test out if I owned an iPhone or an iPod Touch! Would anyone else be interested in testing it out? If so, let me know and I will pass on the information so you can download a free copy. One way I’m trying to save money is by shopping around and doing price comparisons. I’m putting together a price book that includes all products purchased on a regular basis and which grocery store has the lowest price. By doing this, I can tell when a sale is actually a good price and when I need to stock up. 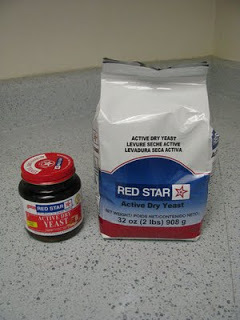 Walmart recently stopped carrying my preferred yeast, Red Star’s Active Dry Yeast. Walmart charged $6.49 or so for a 4-ounce jar. When I found out that Walmart stopped carrying my yeast, I looked at several grocery stores and found that Frys was the only one that carried that particular jar of yeast and they were charging $7.99 for 4 ounces. Ouch. Enter Amazon. However people feel about large corporations driving the little guy out of business, Amazon can usually beat any price. When you’re trying to get out of debt, the savings is vital. I should have looked for yeast on Amazon a long time ago because they have a terrific price. The jar on the left is my normal jar of yeast. The bag on the right was ordered from Amazon. The bag from Amazon is a terrific deal. To buy 32 ounces worth of jars, I would be spending $63.92, instead of $14.88 to buy a bag online. Because we were also ordering hubby’s birthday present, shipping was free and we saved $49.04. I would consider that worth ordering online and waiting for the shipment. I just refilled my jar and tossed the rest of the bag into the freezer for later. Dave Ramsey is giving away a $999 emergency fund. I didn’t find out about this until after it started, but he’s giving away an emergency fund every day until 9/17/09. You can enter each day for a chance to win. We already have an emergency fund in place ($1,000) but I’m still entering the drawing. If we win, we’ll use it to pay down our credit card. I had an excellent shopping day. We don’t usually shop at Albertson’s, but they were having some good sales that I couldn’t pass up. They have selected cereals on sale for $1.50 each box, taco shells for $1.25 a box, and enchilada sauce for $1.25 a can. For the Mexican food, you could buy any combination of taco shells, enchilada sauce, and another product and the price would come out to 6 for $1.25 each plus a coupon for $3.00 off your next Albertson’s purchase. Grand total: $9.62!! I also received a coupon for $3.00 off my next order. I saved 63% ($16.70) on this trip. After work, hubby and I returned to Albertson’s to use the coupons I received this morning. The first coupon was for $1.50 off the purchase of three boxes of cereal. The second coupon was the $3.00 reward coupon off the next shopping trip. Because the boxes were $1.50 each, we got all three for free! We now have three extra boxes of Cheerios in our pantry. Day 16 of the cleaning challenge is all about fighting laundry piles. I have to admit, the above quote is pretty accurate! If I only do things that are fun, laundry would never be complete. Thankfully, my husband needs clean clothes to wear to work each day and thus my dirty laundry pile stays fairly tamed. In an effort to lower our electricity bill, I’ve started line drying some of our clothes. Our apartment complex doesn’t allow clotheslines on the patios so I am forced to be creative. Instead, I hang all of our shirts on hangers and leave them hanging on the shower curtain bar. This has been working really well, as long as I remember to fold or iron the clothes after they are dry. Our electric bill went down $16 last month! This month, I am going to attempt to hang all of our laundry and eliminate the need for the dryer. I’m going to visit the dollar store to see if they carry clothes pins. If not, I’ll check Walmart. I’m going to try pinning the clothes to regular hangers and leaving them in the bathroom to dry. I’m not sure if the clothes pins will fit around the hangers but I believe that’s my only option for hanging work pants and jeans. If I’m lucky, our electric bill will drop again this month. My friend Tommie is hosting a giveaway on her raw food blog. She’s giving away a copy of the book The Whole Soy Story. Check out her blog and leave a comment if you’d like to be entered into the drawing! Last night, hubby and I borrowed Bolt as our free Redbox movie. Based on the preview, I expected a tame, fairly clean kids animation. Wrong! The movie is rated PG, which I suppose is appropriate, but I was really surprised by the (bloodless) violence in the first 15 minutes. It reminded me of The Incredibles, another supposed kids movie that my children won’t watch until they are teenagers. However, after the first 15 minutes, Bolt reverted to a clean children’s movie. It was really cute! My favorite line in the movie came from Mittens, Bolt’s traveling partner. She exclaims that “this is a map of the whole world” and rolls out a map of the United States. Social commentary, anyone? Oh, to eat burgers again! The Lord reminded me this morning to spend some time in prayer and Bible study before starting my day. It was hard for me to sit still and read when I wanted to be up “doing” something but I’m happy I listened. I read three chapters in Mark about Jesus healing numerous people. It amazes me that the Jews had Jesus in their midst, heard Him preach, saw Him healing people, and still wanted to kill Him. I wonder if we would do the same today. I pushed myself again to complete all of my “active” housework early in the day. I completed everything on my list, especially those jobs that require me to be moving around the apartment exerting energy. By 10:45 I ran the dishwasher, washed some pots by hand, baked cornbread, vacuumed, cleaned the two litter boxes, swept the kitchen and bathroom floors, took out the trash, swept the patio, and wiped down the toilet and bathroom sink. Hubby was off work by 11 today. We ate lunch together and then hubby took a nap while I created a menu plan and shopping list for this week. In the heat of the day (100+ degrees), we decided to go grocery shopping. I didn’t really want to leave the house while it was so hot out, but we desperately needed to buy food. Our fridge was completely empty except condiments and our cupboards held half a box of Cheerios, a couple cans of tomato soup, and some oatmeal. That’s it. What joy it was to walk around the grocery store and buy more than just pasta. Oh, what joy! I used to take it for granted that I could buy whatever groceries I wanted. For the first time in 5 months, I spent more than $25 shopping for a week’s worth of food. Haystacks, potato salad, baked potatoes, stir fry, spaghetti, Boca burgers, homemade pizza, and macaroni and cheese are on the menu this week. Oh happy day! I spent $45 total by shopping the sales and printing out some great internet coupons, among them two free bottles of BBQ sauce! I will never again allow myself to spend $100/week on groceries. That was our old food budget. Now that we’ve been broke, completely out of money, I’ve learned how to shop inexpensively. I know I still have a lot to learn compared to some of the expert shoppers, but I’ve made a huge dent in our grocery bill these past few months. We were even able to buy hubby some new socks!